When we first launched Anou, we did what pretty much everyone does: set up a Facebook page. We primarily focus on Facebook because we believe it is one of the most effective mediums to tell our story and define what it is that Anou does (shameless plug: like our Facebook page!). A typical post on Anou’s Facebook page. We also thought that it would be a primary driver of traffic and sales to our site. Well, we were wrong. It actually has a minimal effect on traffic and sales on our site. In February, Facebook only accounted for 7% of all traffic to Anou’s online store and directly contributed to none of its sales. Yet we’ve continued to invest time into Facebook because it has evolved into an unexpectedly powerful tool for building the artisan community in Morocco. Our posts regularly feature photos and small stories about what Anou’s artisans and artisan leaders are up to. And as a result, artisans are eager to be featured and Anou’s artisan leadership gains credibility when they’re tagged into photos of a recent training they implemented — even though all the posts have been written in English. The problem is that this powerful tool reaches a small fraction of artisans on Anou because the vast majority of artisans don’t have consistent access to internet, much less a Facebook account. Also, the Facebook page is managed by myself, not the artisans. As we look to improve artisan engagement on Anou, we thought why not take what makes Facebook a powerful tool and apply it to a medium that all artisans on Anou can access and manage? 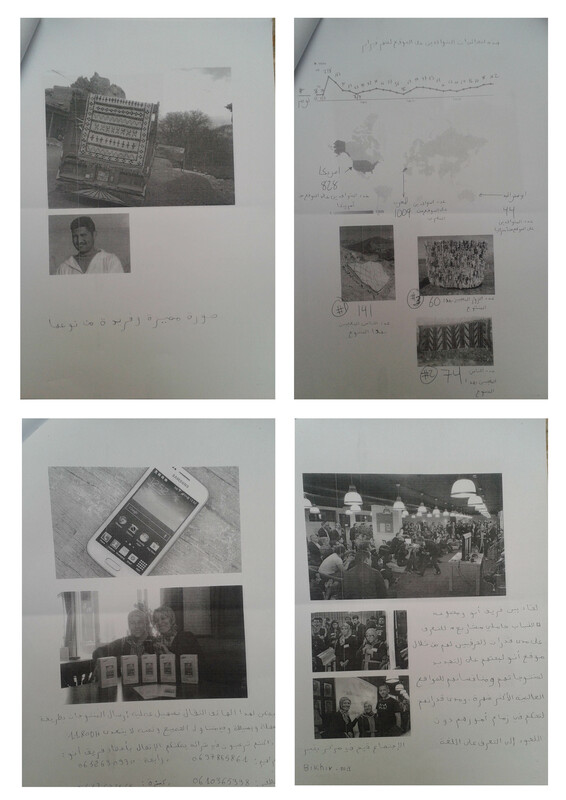 Rabha of Cooperative Chorouk writes a quick summary next to images from last week’s Start up Your Life event for Anou’s newsletter. 1 – Winner of the photo of the month (voted by Anou’s artisan leadership). 2 – Winner of the product of the month (voted by Anou’s artisan leadership). 3 – The top three most visited products on Anou’s online store. 4 – An overview the number of visitors on Anou during the past month. 5 – An review of February’s important events, such as Brahim and Younis’ participation in the New Work Lab’s Pitch Lab. 6 – A small editorial discussing the benefits of buying a smart phone and how to get in touch with Anou’s artisan team to buy one. Pages from the first edition of Anou’s artisans newsletter. The contents are basic, but powerful. And most importantly, keeping in line with Anou’s vision, it was entirely made by the artisans who will benefit from it. 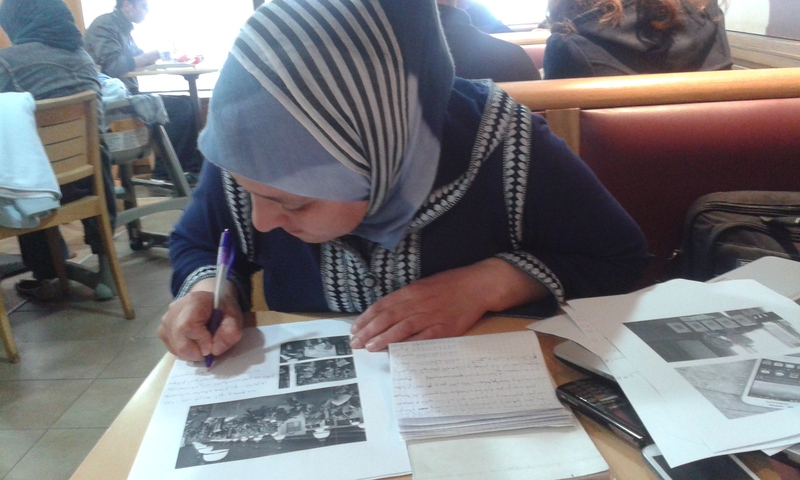 After the newsletter was finalized, Rabha and Latifa printed copies of the newsletter and sent them out to each artisan, association and cooperative on Anou. Immediately after the newsletters were sent, Anou artisans already began sending in ideas of topics they wanted to write and discuss in the next newsletter. The newsletter has an immense amount of potential and we’re excited to see where Anou’s artisan leadership develops it. We’re kicking ourselves that it has taken us this long to develop this idea. We tend to forget that even though Anou heavily focuses on solving the greatest challenges artisans face via technology, the most effective solutions are the ones that involve no technology at all! In our last e-mail newsletter update (Newsletter? Sign up on our about page! ), we noted that one pressing challenge is that artisan engagement after adding their products to the site has been worryingly low. Only 20% of the products that have been posted since December have been modified in any way. This means that artisans haven’t been updating their products based on the feedback they’re receiving. This is a concern because Anou’s long-term success depends heavily on how engaged artisans are in selling their product as well as learning from their successes and failures. This has both long-term and short-term implications. In the long run, if artisans aren’t engaged, their products stay the same and they will remain dependent on others to evolve their business. In the short term, you don’t need to look further than the analytics of Anou’s online store: When Anou’s homepage stagnated with unchanging products, the number of return visitors dropped by 16% and sales slowed. If artisans simply post items and forget about it, Anou is going to struggle. In exploring ideas of how to reverse this trend, we’re continually faced with tension between whether to better educate artisans or build more effective online tools. In the past month, we’ve implemented a mix of both. Anou’s artisan team has substantially increased the amount of follow up calls to discuss the feedback artisans receive and suggest possible ideas to improve their ratings. In addition to this, Anou’s artisan team published its first monthly newsletter, which was snail mailed to every artisan. On the building side, we’ve begun testing concepts of language free research tools that enable artisans to dive into more details of the feedback they received. Also, we’ve invested a substantial amount of time improving the backend of the site to decrease errors on the artisan page. The challenge of getting more artisans involved in their business isn’t a quick fix. But with careful monitoring of the result of the above efforts, we’ll learn which tools are most effective in reversing the trend in low artisans engagement on Anou’s online store.